Ah emotional vulnerability…that scary fear of exposure, potential failure and the possibility of rejection or pain. 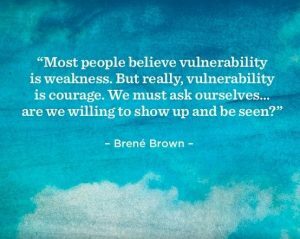 I have struggled most of my life with vulnerability due to my core fear of rejection and potential failure. But why is being vulnerable such an essential component of relationships? And not just sexually and emotionally intimate relationships between couples, but also intimate relationships between family and friends? Our closest relationships are, just that, close. Created due to our willingness to allow the people we care about to really see and know us. Here lies the beginning of the end for many of the couples and families that I am grateful to be trusted to work with. As we slowly expose ourself to the important people in our life, and begin to reveal the dark corners and blemishes of who we think we are, we become vulnerable. As we share and express our inner thoughts and feelings we develop a closeness, and intimacy that feels so loving and powerful…yet terrifying. Our mind races! “What if they learn too much about me and don’t love me anymore?” “What if I make a mistake?” “Maybe I shouldn’t have shared all that?” Or worse, that ugly little voice that whispers “what if I’m not good enough?” Sharing and exposing who we are can leave us feeling naked and afraid. Perhaps we self impose the idea that we have to be perfect. Have it all together and avoid mistakes and failures. But what about actual hurt because of vulnerability? Many of us have in fact been hurt in those very intimate moments and learned to protect and avoid emotional injury from happening again. Over time we can become less willing to share and risk in the very relationships that require it for intimacy, Eventually we find ourself in this state of conflicting emotions. Loving and wanting to regain that closeness with the one’s we love but afraid and unwilling to go there again. Often this is the place that I find many clients fighting to make their way through. Lost in the years of risk and hurt and unsure how to get back. So how do we turn it around? I believe that it begins with ourself. Our personal willingness to be honest with ourselves about how we feel, what we fear, what we need, and risking asking for what we need. Vulnerability with ourself spreads into our relationships with others. Brené Brown has spent the last 12 years deep in the study or vulnerability and shame. Her research and books share her discovery and insights and have become an important part of my own journey towards choosing to be vulnerable with both myself and the world. So I will share what I practice as I continue on my journey towards increasing vulnerability and overriding my instincts to retreat and protect myself. First, I have committed to consciously checking in with how I feel, without judgement and minimizing. This has been surprisingly difficult as I have spent so much of my life downplaying my feelings to minimize creating waves or being considered irrational. Feelings are irrational. Next is the uncomfortable conversation with my fears. What are they? What purpose do they serve? Often fear is a subconscious caution sign to warn us of dangers ahead. I am constantly working to honour my subconscious warnings, yielding in my life, and working to challenge them when they are no longer are needed or impeding my growth. Lastly, questioning “what do I need?”. If I don’t know and advocate for what I need, how can I expect the world to respond and support me effectively. The “what do I need?” question has often landed me in my most vulnerable of needs which is boundaries. Boundaries are often overlooked as vulnerability, but sometimes they are the most vulnerable of all. Setting boundaries or saying “no” to protect what’s important to me like my family and downtime, in a world of productivity can be risky. It can also disappoint or upset others, which for me, as I said has been very difficult to do. The journey towards vulnerability can be bumpy and is almost always uncomfortable. Be kind with yourself, forgive your imperfections, and remember you’re worth it! Stay tuned for my next article on empathy and its power in the relationships which we value the most!